Views from the loch. : The changing loch level! Photo 01- The boathouse under siege! December has been one helluva strange month with temperatures more akin to that of late spring and water pouring from the clouds in amounts that hasn’t been seen for many a year! 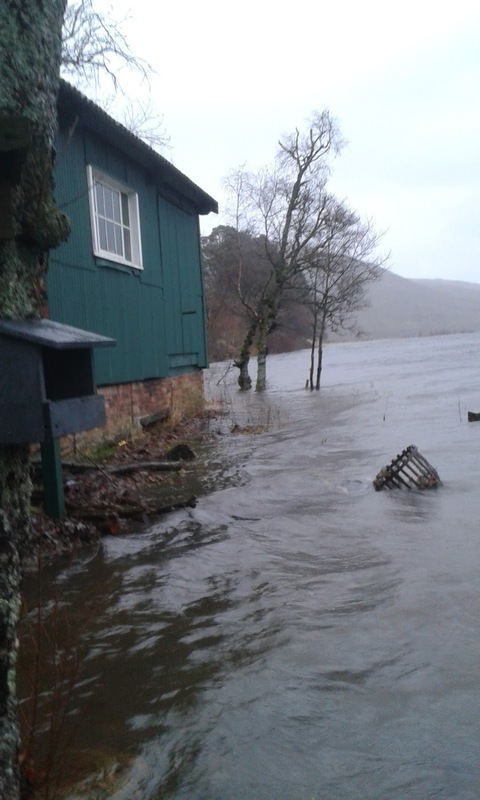 At the lochs we can withstand massive downpours and still be able to fish something river anglers cannot do! I suppose that if we have to endure massive downpours then this time of year is the best time to have them as only a small number of grayling fishers on the river are affected. 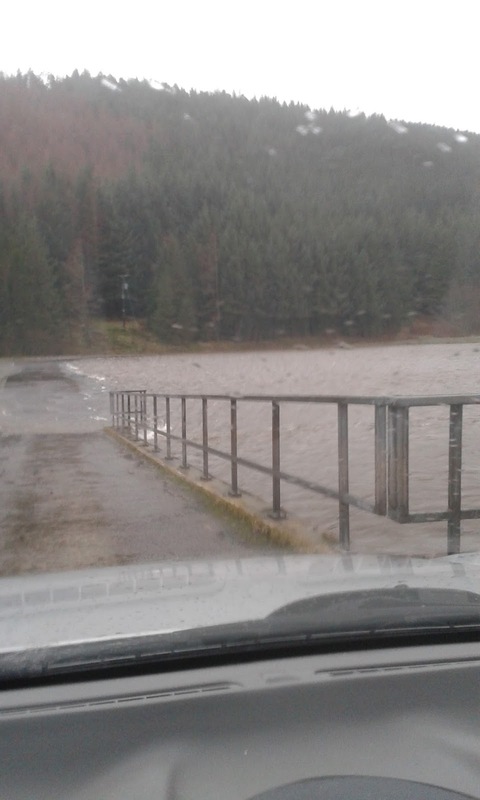 Most members by now will know that the loch is being used as a water holding area as part of the Selkirk Flood Protection Scheme. It works by firstly using weather forecasts predicting very heavy rainfall likely to cause flooding. Prior to the arrival of that rain, water is let out of St Mary's in a controlled fashion via a completely automated electronic system to reach a level akin to low summer levels. 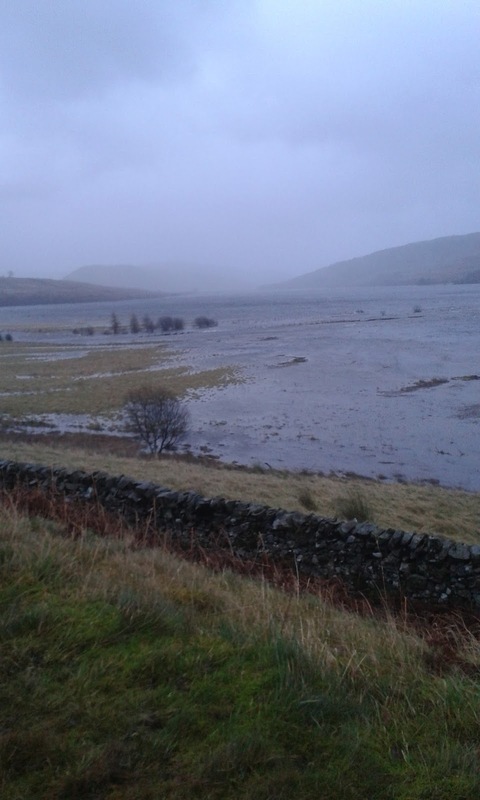 The space created in the loch is immense and millions of gallons could be accommodated hence diminishing peak flows down the Yarrow and hopefully prevent flooding! 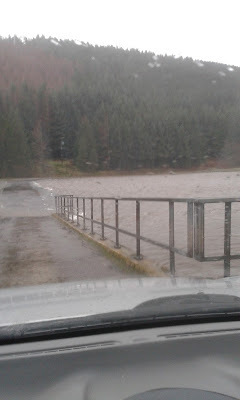 As you can see from the photos taken by Mr Xxxxx the loch can get pretty full in a short time if there is a deluge due to the vast collection area! Of course this causes problems for local farmers and others on the banks of the loch but what is the alternative! Of course there is an alternative and that is to drain the loch much further than at present prior to any predicted event. 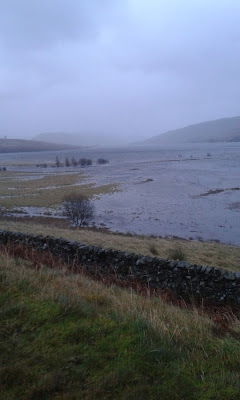 That would render the loch sterile, devoid of life and with that the demise of Cappercleuch as a tourist venue! The lower the level on St Mary’s the more dangerous it becomes as the V shaped crevice that characterises the lower levels of the loch would become exposed and in fact become a very dangerous shoreline, almost certainly requiring the loch to be made inaccessible to stock and to the public! For us anglers we can fish whatever the level however a familiarity with the floor of the loch is essential. The mantra must be look before you leap if you cannot see the bottom you do not progress! There are a lot of competing interests with regard to the level of the loch and the angling club is situated right at the bottom of that pile! Flood protection is now a very hot political potato following the shameful performance of the Tories and takes precedence over any other interest without exception. Our worry is that the loch is drained so low that the fauna living in the margins die off leading to a shortage of food for our fish populations. Of course this would be an extreme event but it is possible and there would be nothing we could do as flood protection takes precedence over all! The changing level of the loch is just another variable that we as anglers will have to deal with! It’s not an ideal situation but it is where we are! There are but two choices quit or live with it, we are committed to doing the latter! Photo 02 - There's a road there somewhere! I refer to last week’s post when I mentioned by name a few individuals who had extended to the club help much in excess of what should be expected of anyone. I neglected to mention two of our top members Gordon McClurg and Mike Wood who gave of their free time to construct a new bottom on our parking area which had turned into a mud bath! I have amended last week’s post to record their efforts and I can only apologise for leaving you both out of our honours list! I made a mistake, but the man who never made a mistake, never made anything! I put it down to a particularly fine brandy delivered by Santa and devoured by me! So Gordon and Mike thank you for your work it was as usual way beyond what should be expected! It is actions such as these that push the club ever forward! The window has now opened for renewals and new members wishing to join the club. Click the link in the sidebar and you will be taken to the application form which you should fill out in full and send to Mr Xxxxx with a cheque (payable to St Mary's Angling Club) for £35.00 or £55.00 for new members. A digital passport type photo is also required and this should be sent electronically to Mr Xxxxx along with a Stamped Addressed Envelope (SAE). You application will then be processed and your membership card will be sent out as soon as possible. Please do not leave it until the last minute get it done now. Photo 03 - The Megget about to be engulfed! Well the New Year has started and yet again it is a chance for a fresh start. However you can bet your bottom dollar it will be business as usual! There will be more of the now expected conjuring tricks from minister without a clue Gideon Osborne who whilst losing millions will conjure up an albeit meaningless titbit for the needy. Lord Snooty will continue to big up the irrelevant reforms he plans to unleash on the EU! Of course they amount to nothing but since he will have met his own objectives he will return victorious having fought the battle for hardworking families! Failed PM Iain Duncan Smith with ever faithful Thatcherite Priti Patel will continue to hammer the poor whilst insisting they will be better off! It looks very much like things will remain the same with the Tories slashing budgets then quietly reinstating that funding when there is a public outcry such as there has been over the disgraceful manner in which they were exposed with their funding cuts to flood protection. They slashed spending on flood protection in 2010 forcing what little that could be done on to already overstretched councils. Since that day they have had to gradually reinstate that cut funding and into the process ruin the lives of thousands of people not to mention the extra spending the flood damage will involve! There will be more rhetoric promising to help hardworking families whilst coming down hard on those whose curtains remain closed until mid afternoon. The reality however is that nothing at all will happen, it’s just idle chatter! Yes we will see those with mental health problems further restricted in what they can do when their daily living funding is cut. We will see the disabled and unemployed further punished being made to jump through more pointless hoops! We can expect to hear of more so called military success as they try and recreate the “glory” days of the British Empire! Look out for more intervention in countries where we have no right to be! Unfortunately we will see along with this many civilian and many military deaths. We can expect to hear more of how they are supposedly sorting out our country but little of how they are increasing the national debt! We will hear much of how they are beating unemployment but nothing of the low pay zero hour’s contract, part time dead end jobs that they are pushing people into! Expect the “recovery” to be rammed down your throat, but you will hear nothing of how this “recovery” is built on a house of cards propped up by consumer debt which could and probably will crash. Expect to see pay day lenders expand dramatically and along with them food banks, perhaps the greatest achievement of these directionless fools! Undoubtedly you will see much more ducking and diving over housing a decent numbers of refugees as Snooty panders to the extreme right wingers in his flock! Look to see Jeremy Hunt the richest posh boy in the cabinet picking more fights with under pressure NHS staff then quietly back down when public opinion overwhelms him! Watch as our NHS in Scotland is quietly strangled due to chronic underfunding from Westminster in spite of the best efforts of our government! You will not be surprised when the top 1% earners in the country are given even more tax breaks and the rest of us carry the burden of Lord Snooty’s austerity cuts! We will watch in amazement as Snooty comes back from Brussels waving the Union Jack (having achieved nothing) but will make no mention of the cost of his campaign, his private jet or the cost of the referendum! Yet again his extensive efforts to achieve absolutely nothing will end up costing us hundreds of millions of pounds! The current government is replete with fools, jesters and charlatans just as it was in years gone by! Surely this is no way to run a government in the 21st century! Thinking ahead seems to be a concept that has avoided the Tories, they always end up being reactionary, furtively chasing events! You will not hear of real initiatives to remove poverty, to strive for equality, to build a manufacturing base, to give workers meaningful employment rights, to curb the excesses of the top 10% of the population and most importantly to purge humanity of the greed culture that currently plagues and shames our country! It is clear to the people of Scotland that this mess of Tory lies can no longer be tolerated. By the election of the SNP the people of Scotland have rejected the status quo and opted for equality and fairness! It now falls to the Scottish government to expedite plans for another referendum so we can get out of this unholy mess! It will require a lot of intelligence gathering to time the event properly but it must be done at the earliest opportunity or we will all be damned!